I have to admit that I haven't gotten on very well with the Natio range of products in the past. I like the idea behind the Australian range but have felt that the products have failed to deliver. However, I was recently sent some products from their new Meditate range and decided to keep an open mind when testing them, starting with Natio Meditate Body Scrub. Upon first impressions, I liked the packaging. It's a sleek design which has a spa feel to it and features a yoga inspired illustration to reiterate the Meditation theme. It's presented in a functional tube, which is always my preference when it comes to scrubs (and most products for that matter!). The scrub itself has a thick paste formula which needs to be applied in the shower or bath, onto damp skin. A little goes a long way and I feel that the tube would last for some time. I loved the delicate scent of the scrub, which smells quite luxurious although it didn't linger on my skin afterwards. The exfoliant is in the form of finely milled walnut shells and these made for a much more gentle scrub than I was expecting. As a general rule, I prefer a satisfyingly rough scrub on my body but these were effective nonetheless and my skin was left feeling soft and smoothed. It also contains Tumeric which is traditionally used to brighten skin. I still needed to moisturise after use. 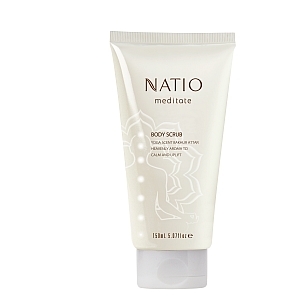 Overall, I've been pleasantly surprised by Natio Meditate Body Scrub and at £13 for 150ml, I would recommend checking it out.